Somali Fair Fishing met 2009 Puntland presidential candidate Nuradin Dirie and former head of UNICEF in Somalia Christian Balslev-Olesen this week. 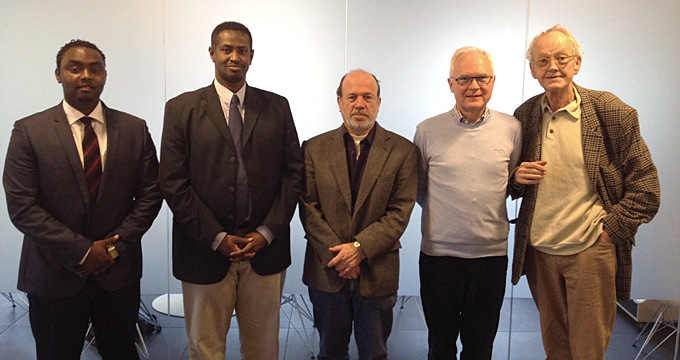 From left to right: SFF board member Said Hussein, Nuradin Dirie, SFF Chairman Knud Vilby, Christian Balslev-Olesen and SFF board member Jakob Johannsen. In the meeting Somali Fair Fishing presented the project, while Dirie and Balslev-Olesen gave valuable feedback on local conditions in the Somali region, providing ideas for the future path of the Somali Fair Fishing project. Nuradin Dirie is an independent analyst specialising in the horn of Africa with particular interest in Somalia. He was a Presidential Candidate in the 2009 Puntland Elections. Nuradin Dirie served as senior special advisor to the United Nations Children’s Fund in Somalia. He also coordinated humanitarian aid following the 2004 tsunami in the Indian Ocean. Christian Balslev-Olesen is the former head of UNICEF in Eritrea and Somalia. At the moment he heads the UNICEF office in Libya. Balslev-Olesen was general secretary of the Danish Church Aid from 1992-2002 and has worked as a senior manager at Nordic Consulting Group since 2009. Support FairFishing in their work for nutrition, employment and economic development at the Horn of Africa! Become a member on yearly basis and follow the results of our work. See details under “Support our work” in the menu. Visit and follow our Facebook page!